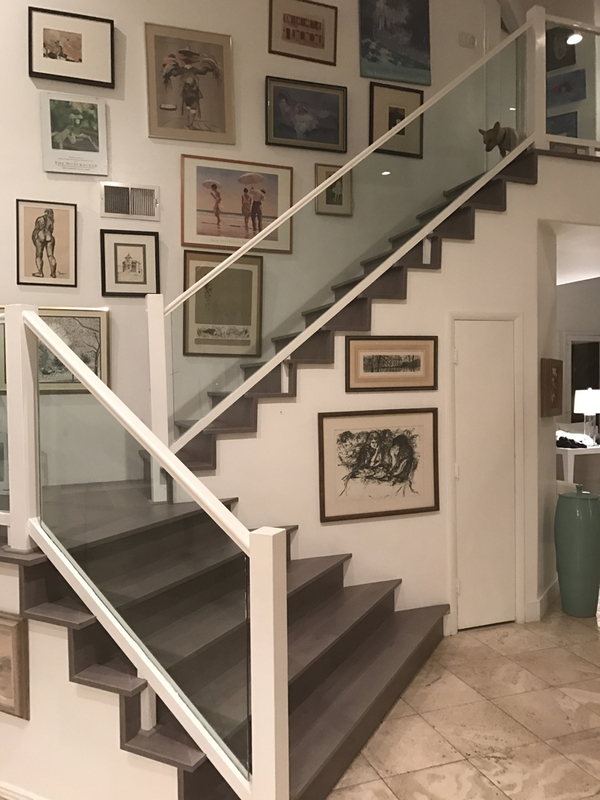 Mrs. L came to Arizona Hardwood Floor Supply looking to get her floors and stairs done after the holidays but before a family party. After she had met with one of our Gilbert showroom estimators, she chose a product that showed up and looked nothing like the sample. We then discussed how wood manufacturers have dye lots and that this one must have been run at a different time than the sample. Mrs. L chose to reselect, and she picked Bravada Latitude Grey Goose white oak 7.5 inches wide, a Single and double stained oak for today's contemporary colors. Lightly wire brushed veneer for texture and depth. Everything was ready to go for install except that the stair nosings needed were on a long back order. Mrs. L asked if there was anything we could do? We decided to make the nosing out of the material she chose. It took us a few days to craft the moldings and another day to blend some colors, then a couple of days to install but everyone thought the final product looked great. It’s nice to see the craftsmanship involved in a process like this!